Kevin McNaughton signed for Wigan Athletic yesterday on a one year contract. McNaughton was released by Cardiff City this summer, after spending the last season on loan at Bolton. After a summer of uncertainty, Kevin McNaughton today committed his future to Wigan Athletic. Having fallen out-of-favour at Cardiff City, McNaughton joined Bolton on a three-month loan spell in September 2013 and impressed so much that he immediately returned to the Bluebirds defence upon his return to the Welsh capital. His new-found lease of life at Cardiff didn’t last long, however, and he was back with Wanderers in July 2014 – this time on a season-long loan – as then-boss Dougie Freedman landed a target that had previously served him well. McNaughton started the campaign as first-choice right-back, but a troublesome hamstring injury put him out of the side soon after Neil Lennon’s arrival at the club. With Wanderers struggling for options at the back, fans questioned the manager’s decision to continually overlook McNaughton for a place in the squad. In response, Lennon revealed he wasn’t happy with the player’s efforts in training but then, surprisingly, threw him straight back into the side the following weekend. After a four-month exile, McNaughton looked to have earned a second chance under Lennon but was cruelly struck down with a broken leg in the following game and ruled out for the remainder of the campaign. All things considered, the majority of Bolton fans took pretty well to McNaughton. He has his limitations, which are to be expected at 32 years of age, but you could never fault him for effort, something which many young players severely lack these days. We wish him well at Wigan, even though I’m a little surprised he didn’t get snapped up by a Championship club. Had luck been on his side last season, he may well have earned himself a deal with Bolton. Unfortunately, for him, a new manager came in and didn’t have the same opinion as his predecessor. We had previously learned about McNaughton’s time at Cardiff through Benjamin James of the View from the Ninian fan site. 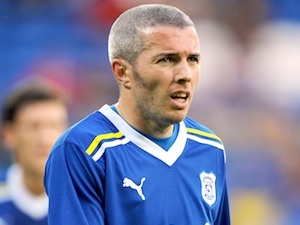 What to say about Kevin McNaughton? A player who most, if not all Cardiff fans, would have gladly kept. A player who came in unheralded and went on to become one of the most revered players of recent times. The very definition of a club legend. The image of him on the pitch after our promotion to the Premier League is iconic – he, out of all those players in the squad, deserved it more than most. Near misses and play-off disappointments were felt most by him. It looked as if for all the years he had given us, he was going to miss out on some Premier League action; a loan to Bolton looked to signal the end of his career at Cardiff City. But he returned and I was so happy that he got to play in the Prem for us. Wigan have signed a player who will build an incredible rapport with the fans. You’ve signed a player who will leave it all on the pitch. You’ve signed a player who will be invaluable to the dressing room – if you want someone to dress up as Dangermouse, he will be the first to do it. I’ve seen him knock himself out in consecutive games, take out lino’s in his quest to get to the ball and outpace the quickest of players. I can’t think of a bad word to say about him and I know I’m not alone in this. In an ideal world, Kev would have seen out his career with us. He became a true fan favourite in his nine years with the club and he will be missed. He’s played all across the back four and even in midfield at points. He’s seen the best of times and some of the worst yet he’s stayed as consistent as ever. I really hope he succeeds at Wigan and Wigan succeed with him – he deserves nothing less.